B&C Transit Inc. corporate office is located in Fort Lauderdale, Florida. B&C Transit Inc. headquarters is in Oakland on the California coast. B&C Transit Inc. employs approximately 90 personnel composed of executives, project managers, engineers, technicians, consultants and support staff. B&C Transit Inc. has additional offices in Sacramento, Los Angeles, Rhode Island, Maryland and Pittsburgh, Pennsylvania. B&C Transit Inc. has excelled in serving the public transit sector for over 25 years in automated train control design, technical engineering, system installations, field testing, networked and stand-alone control, office monitoring systems, station communications, and design-build engineering. With representatives throughout the U.S., and with systems becoming increasingly more complex, you can be sure that our experience, expertise and highly respected reputation will provide for robust transit solutions regardless of size or location. B&C Transit Inc. has excelled in past and current projects based on close cooperation and flexibility with the hosts of personnel involved in each of its transit endeavors. Whether your requirement is for micro-processor or relay based train control systems, reconfiguration and alignment of control facilities, or assistance with new technology, B&C Transit Inc. should be your first choice. B&C Transit Inc. is dedicated to meeting or exceeding all requirements and expectations while maintaining cost-effectiveness. 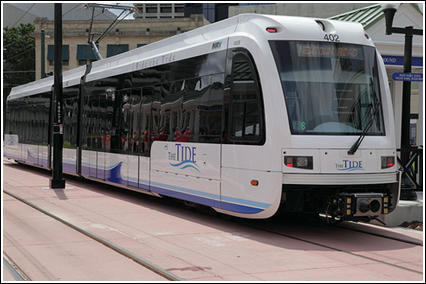 With our broad knowledge and experience of labor, supplies, project management and engineering, we ensure your transit project design, schedule and control. B&C Transit Inc. knows how the obstacles of working conditions, lead times, scheduling conflicts and engineering changes affect the project. We have the industry insight and valuable knowledge that can help minimize project delays and cost overruns. B&C Transit Inc. is customer-focused, solution-minded, and performance-driven. We are committed from start to finish to make your transit solution work. Our unmatched safety record is a result of our improved designs, engineering, maintenance and rigorous safety protocols and procedures. The Stations, Surface Track and Systems Project comprise Phase 2 of the overall Third St. Light Rail Transit Project. This endeavor will provide rail service and serve regional destinations such as Union Square, Moscone Convention Center, Yerba Buena, and AT&T Park, as well as connect directly to BART and Caltrain, the Bay Area’s two largest regional commuter rail services. The project includes a Twin Bore Tunnel alignment of approximately 1.7 miles, plus a short surface segment to connect to Fourth and King Station, the current terminal station for the Third Street Line. It has three underground stations; Moscone Station, Union Square/Market St. Station, and Chinatown Station; and one surface station: Fourth and Brannan Station.B&C Transit Inc. is responsible for the providing engineering services to advance the preliminary engineering design prepared by others to final design and prepare Contract Documents for the Surface, Track and Systems Contract. The scope of work includes the surface segment, tunnel segment and system-wide communication elements. Work on the surface segment includes construction of the surface station, utility relocation, pavement renovation and traffic signals. In the tunnel segment, contract scope includes track invert and drainage and walkway. 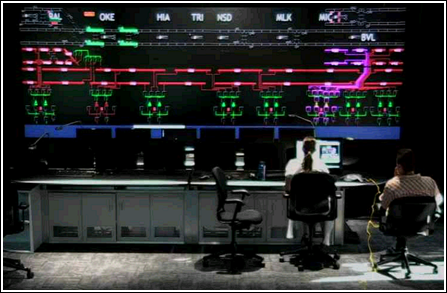 System-wide elements of work for both surface and tunnel segments include trackwork; mechanical systems including plumbing, fire protection, and emergency ventilation; communications systems including Fiber Backbone Network, Supervisory Control and Data Acquisition (SCADA), Fire Telephones, Emergency Telephones, Mayor’s Emergency Telephone, CCTV, and Radio; electrical lighting and power; overhead contact system and associated parallel feeders; Advanced Train Control System (ATCS) for the subway; and surface signaling. All of the new systems will be integrated into the new Transportation Management Center (TMC), which B&C Transit Inc. also played a major role in the design and implementation of. Working with JL Patterson, B&C Transit Inc. is providing engineering and design services for the installation of a new Pedestrian Grade Crossing Warning System (PGCWS) at 27 grade crossing locations along the existing LACMTA Metro Blue Line.B&C Transit’s scope of the PGCWS project includes the provision of construction documents for the installation and testing of new pedestrian gates (some locations include grade crossing flasher assemblies and signage). Several intersections required that existing pedestrian gates be relocated, resulting in new conduit runs and upgrades to existing case equipment. 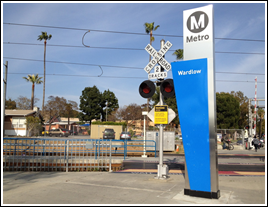 Activation of pedestrian grade crossing warning devices will be initiated by existing vehicle entrance gate circuits, while new equipment is required to meet the environmental provisions of the AREMA ATCS environmental specifications and Metro Design Criteria. As the Prime and Systems Engineer for the SFMTA’s C3 program, B&C Transit in a joint venture effort with HNTB provided a program-wide integration and systems control methodology for the design and construction of its new Transportation Management Center (TMC).The new TMC will replace the San Francisco Municipal Railroad’s (MUNI’s) outdated Operations Control Center (OCC) as its primary control center and will combine all of SFMTA’s control functions which are currently dispersed across the city with a new state-of-the-art facility. A key design requirement included the ongoing use and functionality of the existing OCC, which will be maintained as a backup and redundant facility to the TMC. 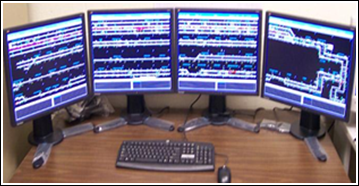 B&C Transit Inc. worked closely with Sacaramento Regional Transit staff on the development and implementation of a four-monitor control system which idenify and indicate all RTD trains on the system map. The GPS location of latitude and longitude is then sent to an SQL database, which the application reads once per second and then adjusts the train locations on the map per the boundaries of each defined area. Operators are able to assign various tracking flags to each train as they travel along the line for identification purposes. In addition to GPS tracking, real time communication was provided to VHLC processors for actual occupancy and switch states. 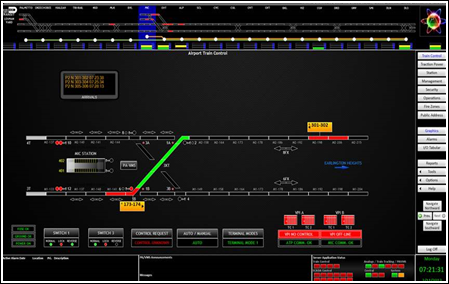 The system contains interfaces for assigning rail cars to trains while assigning crews to those trains along with search features that allowed operators to highlight and quickly spot trains anywhere on the line. 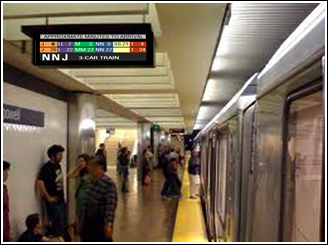 In addition B&C Transit Inc. provided design, procure, and implement of the emergency management panels (EMPs) at aerial passenger stations and at the trench portals. As a systems integrator, B&C Transit’s responsibilities included integration of the TC&C systems. San Diego Sprinter Project B&C Transit Inc. designed, furnished, and tested all signal, crossing and communications systems for the new 22.5 mile Sprinter project from Oceanside to Escondido. The project includes Central office System, 15 passenger stations, over 45 grade crossings and tie-ins to existing freight and commuter rail facilities. Beyond track and signal engineering, this project includes paging, intercom, Visual messaging, backbone network equipment, communication cabinets, emergency telephones, CCTV, and security systems. 05/2006 SAC RT Train Consist Enhancement Modifications to GPS tracking system for development of train consist interface and tracking by both trains and individual rail cars. 3rd Street Extension Design, furnish, startup and test wayside cases to control light rail vehicles along the 3rd street extension. Furnish and install all communications equipment for 18 passenger platforms including head-end interface equipment. 12/2006 VTA Warm Springs Project Warm Springs to San Jose Extension project. 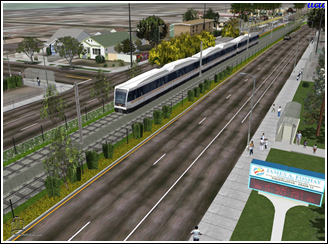 B&C is providing design services for the VTA/BART extension for ATC and communications. Blue Orange Line B&C provided all field personnel required to commission Blue-Orange line for Alstom signaling. 10/2005 ARINC RTU Project Los Angeles MTA. B&C is currently designing and manufacturing 25 remote terminal units that will replace existing out of date units. 06/2005 SF MUNI Muni 3rd Street Installation of over 21 miles of fiber optic cabling for the new 3rd street extension. Complete SONET, CCTV, RISS, Emergency telephone in 18 stations so that all services are monitored and controlled from new Muni Maintenance Facility. 04/2005 SF MUNI Drawbridge Project Design, furnish, startup, and test wayside cases to control freight rail, light rail and drawbridge. 3rd Street Extension Addition Design, furnish, startup and test wayside cases to control light rail vehicles along the 3rd street extension. Furnish and install all communications equipment for 18 passenger platforms including head-end interface equipment. 03/2005 Chevron Technology Center Design/build installation of Cat 6 cabling, communications room build-out and single mode fiber optic cabling throughout 28 building campus. Upgrade of campus 10BaseT shared Gigabit Ethernet. Facility is the only Petroleum research facility in the Western hemisphere. Project requires team to install network around live petroleum experiments where safety is the only concern. 03/2005 SAC RT Switch Control Provide programming change to 3 on-site VHLC processors to send switch, gate, and signal indications to the IT servers in the Sacramento Light Light control center. Interface these functions into the new GPS tracking system so operators can remotely control switches at those locations and monitor the status of switches, gates, and signals. 03/2005 Schools Project Installation of Fire alarm, clock speaker, voice and data, Fiber Optics, and security systems for a number of Northern California school districts. 02/2005 VTA Tamien Project Tamien to Lick Double Track Project. Provide all modifications to existing control points, startup and test new control point locations and furnish wayside equipment for CalTrain/UPRR. 02/2005 WMATA AVI Locator Project Automatic Car Identification (ACI) – provide design, installation and testing for 50 RF scanners at 23 locations throughout the metro system. Twenty of these locations will utilize wireless radio communications to relay data from the wayside back to OCC (operations control center). The other 3 locations will be hardwired. The collected data will be used to track vehicles along the system which ultimately result in mileage calculations to be used by maintenance and OCC. 12/2004 Cleveland Electric AC Track Circuit Replacement MARTA- B&C is responsible for design and procurement of equipment for replacing AC track circuits. B&C is also responsible for modifications of existing TC rooms, field testing and cutovers. 12/2004 WMATA Ground Detector Replacement B&C is currently designing and installing new AC & DC ground detectors to replace outdated ground detectors. 03/2004 SF MUNI Wayside cases Design, furnish, startup, and test wayside cases to control freight rail, light rail and drawbridge. 03/2004 SF PORT Authority Cantilever Drawbridge Design, furnish, startup, and test wayside cases to control freight trains and new Cantilver drawbridge over the Islais Channel for the Port of San Francisco. ON GOING US&SNYCTA ATS Project B&C Transit provided all personnel to supervise installation, conduct field surveys, make all field design modifications, and perform all commissioning for Union Switch & Signal, Inc.
06/2005 MARTA Avondale & Amour Yards B&C Transit is designing, furnishing, and installing a computer based control center for both yards. Systems consist of 4 UNIX redundant hot failover servers, 13 workstations and printers, 8 LCD overview monitors, and 8 video servers over T1 and fiber optic LAN. 9/2004 SAC RT GPS Tracking Completed a 5 monitor stand alone system with graphical representations of the entire Sacramento Light Rail system. The system retrieves GPS latitude, Longitude, Direction, and Speed of rail cars and maps them on the track displays as they move throughout the transit line. This system integrates with a Microsoft SQL database residing on the IT servers. 05/2003 BART SORS Sequential Occupancy Detection System. 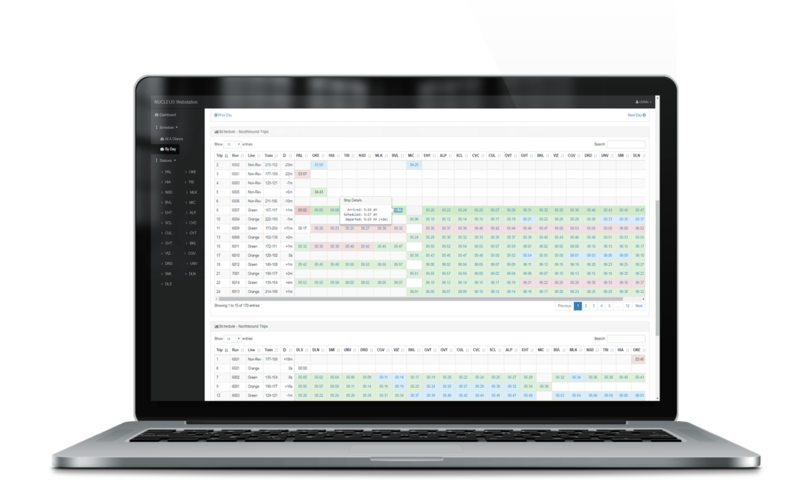 B&C Transit completed office systems for 24 locations to detect occupancies from MUX inputs and shadow trains with pseudo occupancy (rear end protection) using dynamic logic within redundant system servers at each TCR location. SORS computers integrate with Allen-Bradley PLC’s and send all information to the Central mainframes at BART Central via BARTNET (Ethernet IP) for display on on all BART graphical mainline systems. 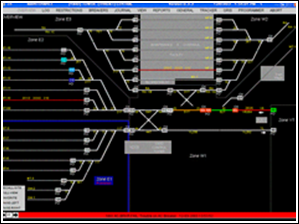 12/2002 BART Airport Extension San Francisco Airport Extension Project: B&C Transit provided all personnel required to manage the overall systems integration for Amelco Electric, Inc. as well as integration of a new Bombardier Gealoc systems into an existing Alstom VPI system. B&C also provided the design and software for 6 fully controllable remote access terminals for the ATC system. 12/2002 BART Daly City Yard Daly City Yard Lead Modification Project. B&C Transit provided all design (new and modifications), documentation, project management, and field-testing required to make all modification required to the Daly City Yard. 07/2002 BART Hayward Yard Hayward Yard Track Improvements. B&C Transit provided all design (new and modifications), documentation, project management, and field-testing required to the Hayward Yard. 06/2001 BART Concord yard Expansion B&C Transit provide all design, documentation, project management, and field-testing required to the Concord Yard. 08/2001 US&SNYCTA 63rd Street Rehab Project B&C Transit provided all personnel to supervise installation, conduct field surveys, make all field design modifications, and perform all commissioning testing for US&S Inc.
12/2003 US&SDART Expansion Project B&C Developed a conversion tool to allow Boolean expressions to be converted to Ladder Logic graphics and vice-versa for Union Switch & Signal vital and non-vital processors. 12/2000 US&SMARTA Extension B&C provided all engineering services (design and commissioning) for the modifications to the Alstom vital and non-vital processors. 11/2000 ALSTOM WMATA F-Line Extension B&C provided all field personnel required to commission the WMATA F-Line for Alstom Signaling. 12/1999 ALSTOM Taipei Blue Line B&C provided all field personnel required to commission the Taipei Blue Line for Alstom Signaling. 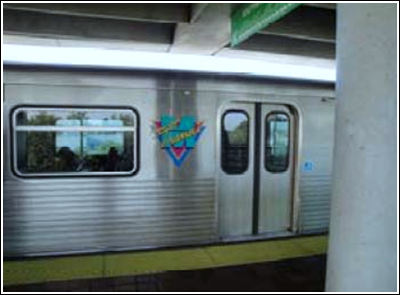 06/1999 ALSTOM NYCTA Seabeach Line B&C provided all field personnel required to commission the Seabeach Line for Alstom Signaling. B&C Transit develops a complete range of rail-related equipment from battery chargers to power supplies to LED message signs. Our Trilogy Products brand parts are of the highest quality and made in the USA. For more information please visit www.trilogyrailproducts.com. For additional information, or quotes for your project, please contact Rick Shovel at rshovel@bnctransit.com or (301)524-9408. B&C Transit Inc. is a service oriented company. We generally provide design/build engineering for all phases of the transit industry that are usually defined by specification requirements or by on-call servicing. But we also consult with our clients based on our experience to provide the highest level systems and designs currently in our industry to assist in meeting specific needs. Our services range from complex to simple, and we are intimately familiar with all new and legacy systems involved within the transit industry.